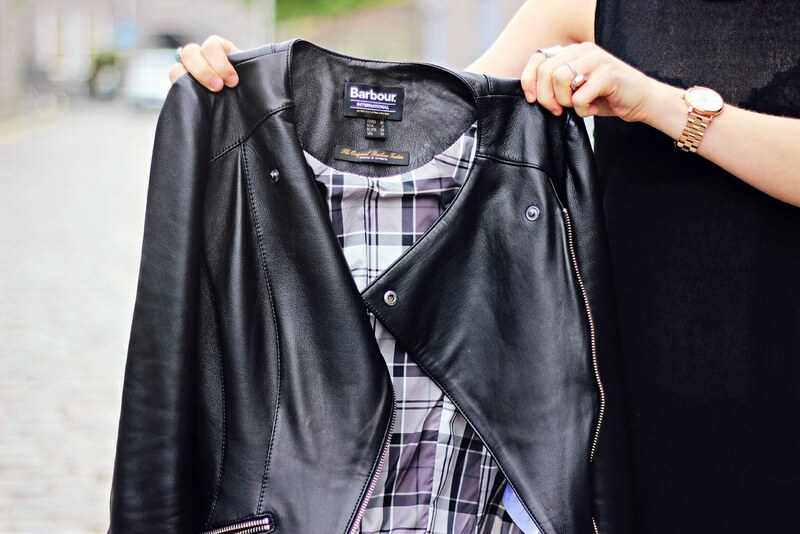 Your eyes do not deceive you, this leather jacket is indeed from Barbour International. Snazzy, huh? I know them more for their quilted jackets (which, FYI, I was DESPERATE for when I was younger, I truly thought they were the key to being cool) so I was really surprised when I went on the website and found a whole selection of leather jackets. This one here caught my eye immediato; with it's square shoulders and asymmetric zip it reminded me of something Queen Moss might wear. It's even better in real life, the leather is like butter (I made rob stroke it in the middle of a restaurant, which he enjoyed until we realised to the untrained eye it might just look like he was stroking my breast) and fits like a glove. A jacket shaped glove. I really like that they've kept the traditional tartan lining though, which is a nice little nod to the brand as if to say, 'I might not look it on the outside, but on the inside I'm aaaaall Barbour'. God I need to stop making my clothes talk. I'm off to Paris (I bet you £10, or should I say 10euro that my Mum'll try to steal this jacket when I meet her out there) for a couple of days but will try and keep my blog updated as much as possible! Until then, you can follow what I'm up to over on my Instagram or Twitter if you so wish. Unbelievable that this super cool jacket is from Barbour. If I would be your mom I would be also in danger to steal it :) Have a wonderful time in Paris! 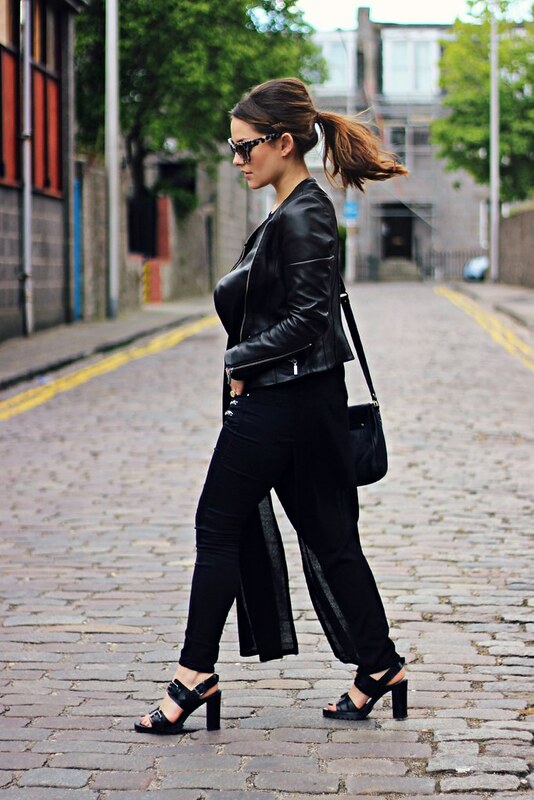 Love this all black outfit! You're looking great! I love this outfit, it is a perfect everyday outfit. I especially love the split tunic from Miss Selfridge and the Topshop jeans. The jacket is beautiful ! Such a surprising design from Barbour, and it's great to see them spreading the message of their new season through bloggers! I didn't know that Barbour did leather jackets either! And I absolutely love your glasses!! So cute! Since when do Barbour do jackets as fabulous as this?! Good spot! Hope you have fun in Paris! This tank is outstanding!! Plus that jacket! Ahh wow it really does fit you SO perfectly!!! You look as gorgeous as ever! Absolutely love that jacket! And no it does not look like Barbour at all! The leather jacket is killer cool. Amazing sunnies too! I love the jacket so much. Great outfit and have fun in Paris! Unfortunately, my mum and I can't swap clothes as we aren't the same size but there are days when we both wish we could ha! Another amazing outfit, love this look! The jacket is bloomin' amazing :) Hope you have a great time in Paris! It looks so buttery soft!! I adore the lining. Barbour has some cracking pieces at the moment.